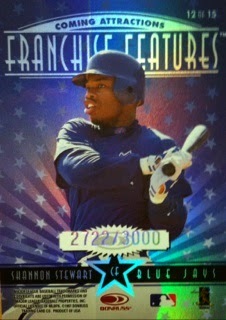 For those of us who collected in the 90's, Fleer trading cards was a household name for us. For those who started collecting in the last ten years, maybe not so much. Either way, all of us collectors have got to appreciate what Upper Deck did with their Fleer ownership in bringing back some of the great Fleer products. This type of product is for all collectors. For some of us it can be a nostalgic reminder or for those who didn't get a taste of Fleer back in that era, it's a whole new FUN collecting experience. I recently was able to get my first taste of both the football and hockey Retro products. Upper Deck included some of the best Fleer products in these including Ultra, Ex2000, Fleer Metal, and Fleer Showcase while not drifting too far away from the original design of them. They also brought back original insert names and autographs from those product. 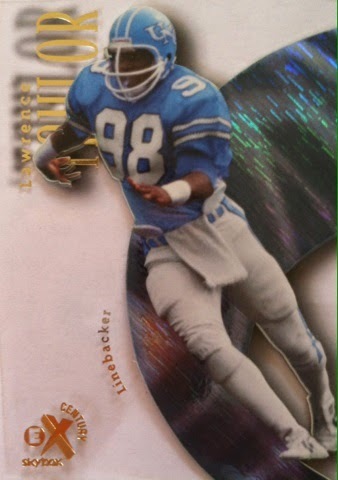 Speaking of the inserts, Upper Deck also took the 90's madness and inserted some at incredible rates making them more rare than some of the hits. This is something else that drives me to the product. I like the chase element. 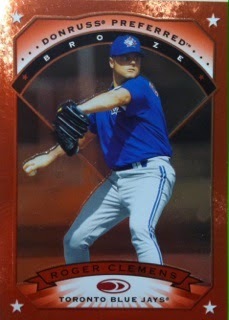 To this blogger, opening up a box of Fleer Retro is like taking a step back in time. A much simpler and fun time where collecting wasn't about the hits. It was about the cards. That's what I think this product is about. 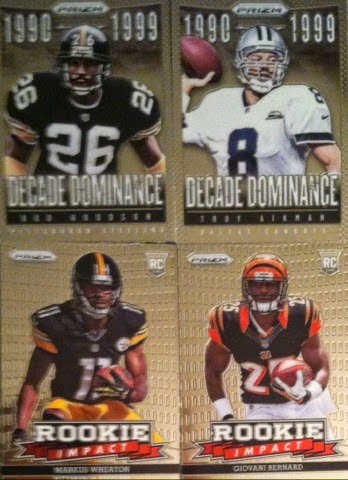 Honestly, I passed by the hits to go straight for the base cards and inserts which most collectors now-a-days brush off. Let me kick it off with my hockey break so you can see what I am talking about. 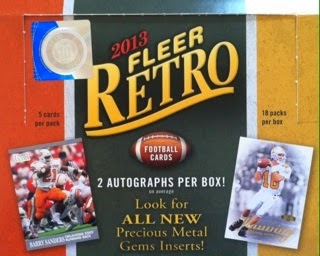 For those of you who know Fleer, get ready to feel like you are in a Time Machine going back into time about 15 years. For those who haven't seen these, you will most likely need to wipe your mouth when you are done viewing this. Let's get this on! 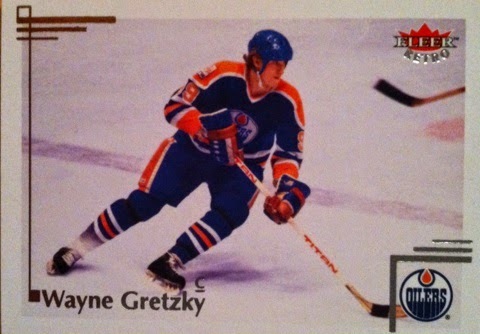 The base cards in the hockey are not an original Fleer brand. It's an Upper Deck one and you can tell. Look at the photography, that has always been their key. Fleer Ultra's design from 93-94 Hockey. SPOT ON! One of my favorite late 90's releases, Flair Showcase has it's 97-98 design. The card stock isn't the same, but the design is. 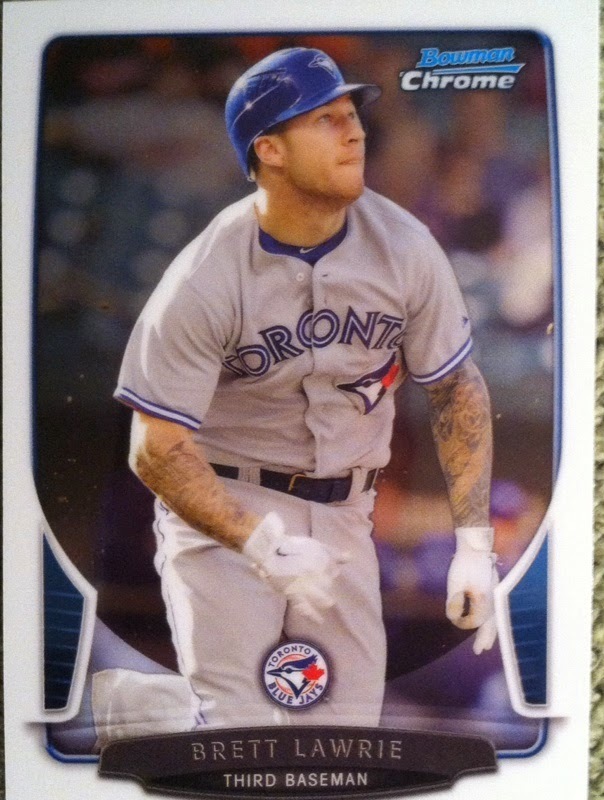 Kudos to Upper Deck on these. 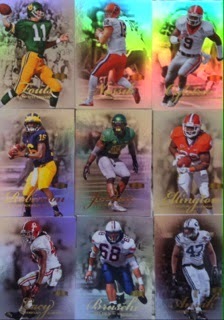 I was also fortunate to pull two Legacy Collection parallels in this box as well. I say this a lot, but this truly is my ALL TIME FAVORITE base card design. 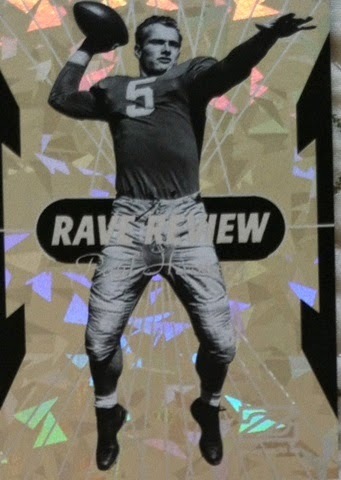 The card is printed on acetate with a 3D player appeal and a rainbow foil hiding behind them. This design is from Ex2001. Some 90's insert design here. Just awesome! My pulls from the box that stick with their original designs. Nothing big, but still cool. Now onto the football break. Very similar in terms of inclusions except the football has a different form of base card. 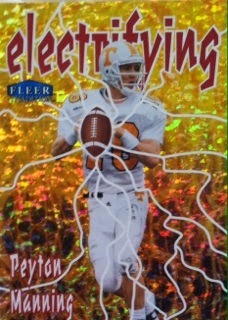 Base cards for Fleer Retro football include the Fleer Ultra design from 1991. Which by the way is again, SPOT ON. Flair Showcase...some great players I found including my guy from the Giants Nassib and beast of a runner in Eddie Lacy. Parallel! You can easily tell the difference. 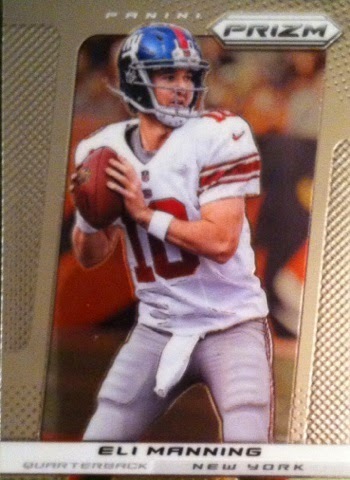 The players name is in blue and the card has a glitter appeal. Two different years of Metal designs included. The feel and look is the same. Once again, love this design! Some 90's insert appeal awesomesauce! 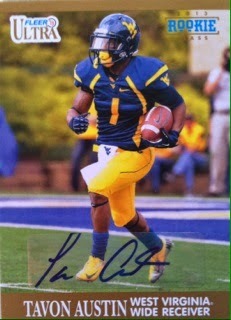 I already loved what I got from the box, this Tavon Austin was just a bonus! Speaking of bonus, I was lucky enough to have this included as well. 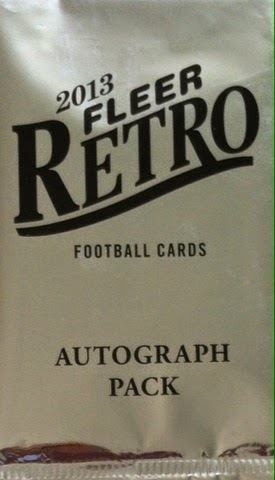 A 2013 Fleer Retro football autograph bonus pack. Each of these comes with three autographs. A nice Eric Reid find in here. 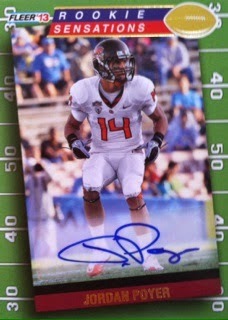 He will be one of the leagues top five safeties in a few years. 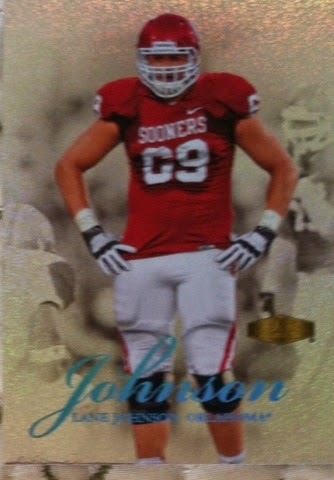 When I heard that Upper Deck was coming out with product like this, I didn't know what to expect. One thing I was pretty sure of was that they weren't going to be like their originals. Cause honestly, nothing is. Boy, I was wrong. 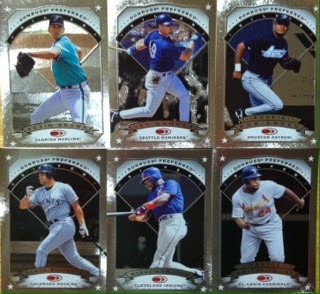 Upper Deck cloned the originals and released them into this time like they never left. Not just any company can do that. Overall I am blown away by this product. There is so much being offered here that I just want to put a set together of everything. So, to answer my title to this post, yes, this is possibly the best thing since sliced bread. 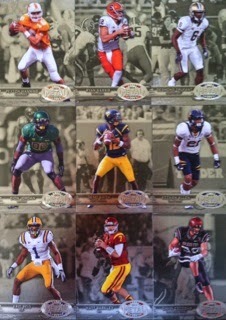 I look forward to see what else Upper Deck does with their Fleer products. Hopefully they will start releasing them individually. I would love to see any of these and especially Ex2000 on the market again. In closing, sometimes card companies need to not always move forward, sometimes they need to look into the past to find success from then. Upper Deck did just that and I thank them for it. PLEASE MAKE SURE YOUR NAME IS ON THE LIST. BEFORE ENTERING! PICK THE WINNER OF THIS MLB GAME! Entry due Wed October 1st by 8:00 pm e.t. As the saying goes....ALL GOOD THINGS COME TO AN END. This contest fits that bill. This contest started way back in April with a good amount of participants before dropping off towards the end. However, for this month, there are only 18 of you allowed to enter the GRAND FINALE! If you don't know if you can enter or not, please check this LIST. If you're name isn't on there, PLEASE DON'T ENTER! Great stuff from BCW Supplies! Make sure to tell them thank you. I will be contributing cards as well. I am not certain what they will be yet, but most likely baseball since this is a baseball contest. Now onto how to enter. This is the World Series of this contest so there will only be one winner who takes home all of the prizes above. Each day I will post a game, most likely due that night, and all you have to do is pick the winner. 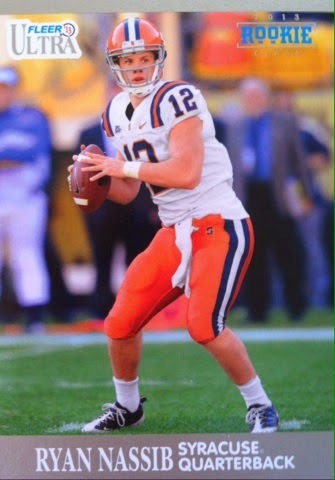 If you get the game right, you move onto the next day. You get it wrong, well, you are in the playoffs, so you are out and further eliminated from this contest. I want to see who is the champ among champions! Each day I will post the next game along with the remaining names who can enter. Once we have it narrowed down to 5 or less names or have reached the World Series, the contest will change for more of a challenging situation. IF, for any reason we only have one person remaining by picking winners, well, obviously that person wins. The first game will be up any minute so get your picks in. If you miss a game, it counts as a forfeit and loss so you will be eliminated. So make sure you pay attention by either subscribing to the blog, checking in daily (I will try to get the next game up first thing in the morning) or following me on Facebook and/or Twitter. 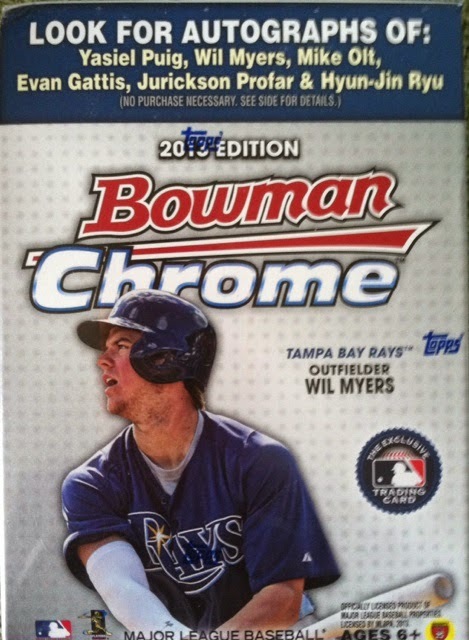 In this edition of Retail Break 'Em, I busted a blaster box of 2013 Bowman Chrome baseball. I found this box discounted and with the chance at autographs one in every few boxes, it being chrome and Yasiel Puig possibilities, you didn't have to tell me more than once to pick this up. 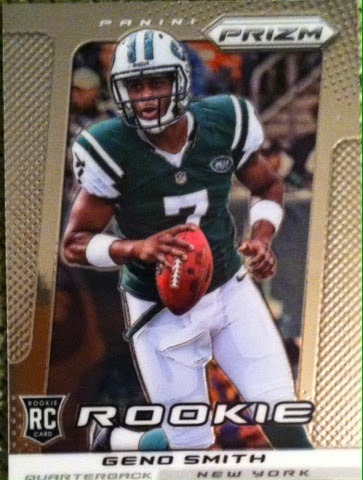 Best base card player from the blaster...this wasn't a good sign to me..
Rookies from the box. No Puig. Nobody. 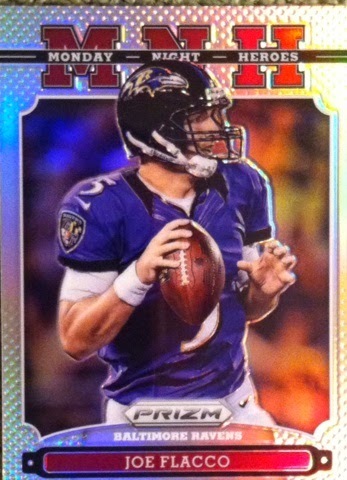 Anything with a refractor appeal is great to me! 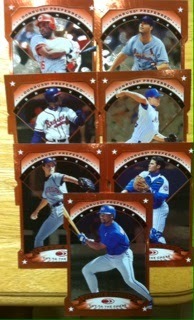 My other refractors in the blaster. Not bad Felix find. X-Factor pack in the box. Not really any big stars. Overall, I felt like I got what I paid for. There wasn't a bunch of big finds and was probably one of the poorer breaks that I have done of Chrome. 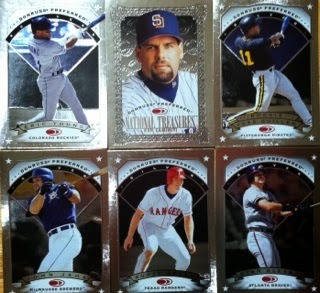 However, refractors are refractors and they all will find a place in my PC in the end. First off, I want to say thanks again to The Pack Gambler for providing prizes for these monthly contests and giving Sport Card Collectors a chance to provide prizes to all of our Canadian friends along with our U.S. friends. 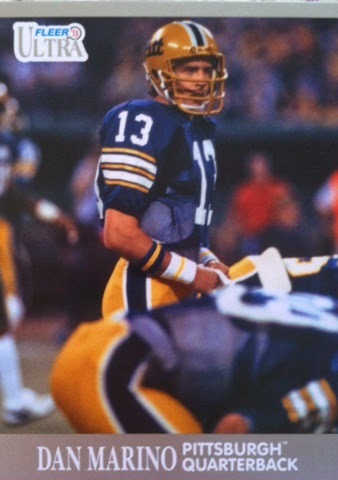 The Pack Gambler truly is a must follow on Twitter and on Facebook. Now onto this months winner. I had 25 entries into this contest. Two of them had Boston with 4. So it goes to the next tie breaker of PIM's which both had guessed the same. So it came down to total goals by the winning team which was a total of 23. Both guessed over, both were very close to each other and by a single goal @NYFried516 is the winner. He guessed one less than his opponent. Congrats @NYFried516! 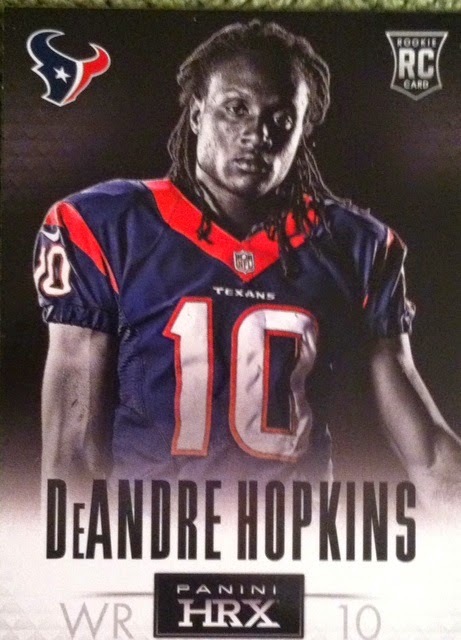 Please email me at sportcardcollectors@hotmail.com with your address and I will pass it along to the Pack Gambler. Thanks again to the Pack Gambler for these contests and I am already looking forward to next months! Remember to follow them on Facebook and Twitter and tell them thanks for these contests. Well, here is another post to what will be many posts of me breaking down what I got at a Yard Sale that I posted about recently.As the saying goes, all good things come to an end. We all knew this had to. I saved my favorite part of the Yard Sale find for last. I saved the micro-etched shiny awesomeness for now. 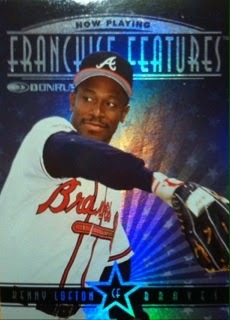 1997 Donruss Preferred was one of my favorite products of the 90's. Not just because of the design, but because it came packed in a collectible. 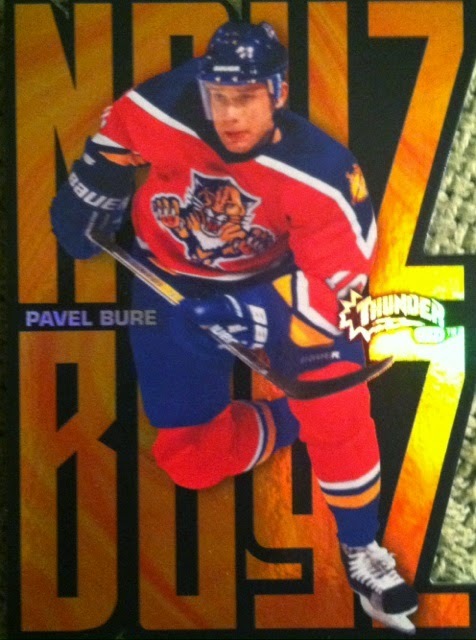 Each 5 card pack came inside of a tin with a featured player on the front. So not only did I chased the cards, but I chased the tins as well. Alright, enough with my rambling. The moment has come for me to show what was in the final box in this yard sale lot. This was a mini white box with roughly 50 cards in it. All of which for a quarter. Let me know if you think I got my quarters worth here. 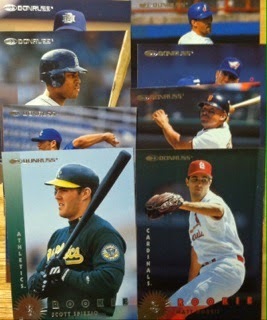 Donruss Preferred base cards were broken down into four sections. 1 Silver Cut To The Chase along with the third of the fourth parts..GOOOLLLD! And finally came Platinum. I didn't get in this box, so click this LINK to eBay to see what those looked like. I can honestly say that I don't think I ever pulled one of those either. Overall, pretty happy to finish up the yard sale lot like this. I am a 90's collector and was a big fan, as I said earlier, of this product. I am also very happy with all of the purchases. I think I got a great steal at $25 for the entire lot. This includes everything that I posted in this series. I know it's going to be hard to swallow not having anymore of these Yard Sale posts to view. Just remember that I didn't buy all that they had. So, there could there be more to come next year from that yard sale if they have one. Time can only tell....and if there is...you guys will be invited to view along. I really appreciate you guys viewing this years Yard Sale breakdown! 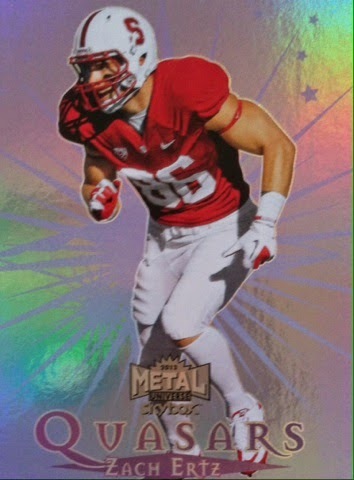 If you have been reading this blog, you know by now I am caught up with things that are both chromed and shiny so that is what leads me to this break of 2013 Panini Prizm football. 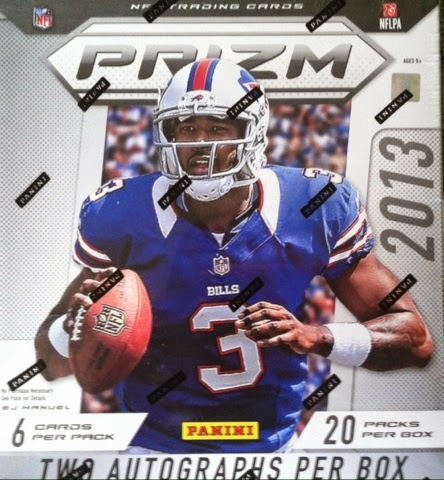 Each box of Prizm 2013 football has 2 autographs, 3 Prizms (refractors in layman's terms) and a few inserts. There is 20 packs per box with 6 cards per pack. 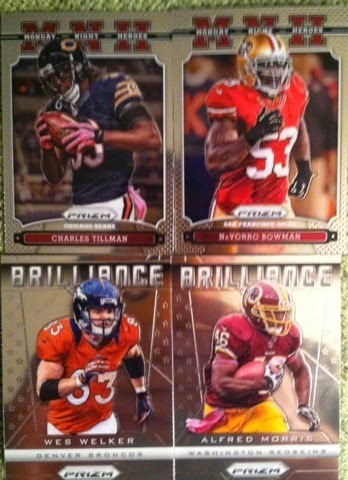 Each pack has a rookie or two. Boxes for 2013 will run you under $65. Then finally a good one. If this guy can stay out of trouble, he is going to be another beast in the history of beast running backs for the Steelers. Overall, not a bad break for the price. 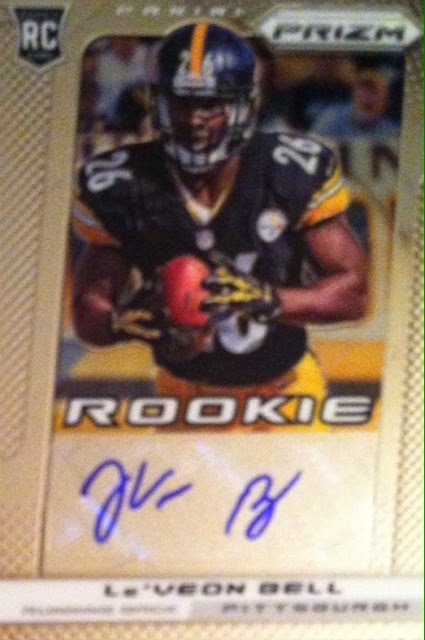 I like the Bell pull and I also pulled most of the top rookies so there was definitely value. 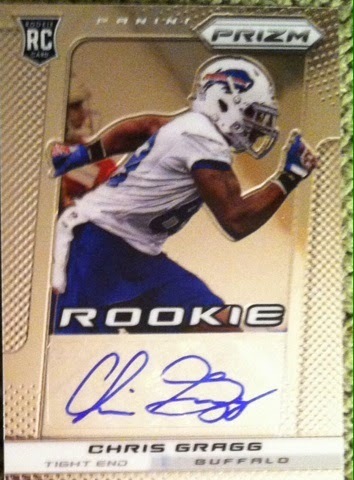 I am pretty happy with the results and for the price of Prizm football 2013 right now, I would most likely go back and try another. 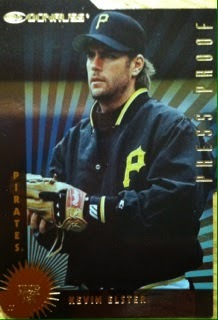 Baseball Card Yard Sale Find Part 16: 1997 Donruss...WITH INSERTS! Well, here is another post to what will be many posts of me breaking down what I got at a Yard Sale that I posted about recently. Today's post is small but sweet. 1997 Donruss baseball was a product I loaded up on when it first released and it brought back many memories when I discovered it in this lot. I liked the base card design and the inserts especially. You know, they are shiny. What collector doesn't like shiny things. Not to mentioned, some are also numbered. And most importantly...I found some inserts in here! Check em out! These were the small pile of rookies I found. 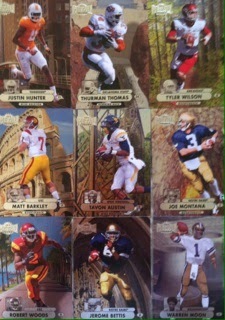 There was about 50 base cards and then these headlined by Matt Morris and Ben Grieve. Bring on the awesome 90's inserts! These were tough pulls! Beckett has them listed at 20X base value. I don't think I ever saw a gold die-cut up close til now. Like I stated earlier, not much, but sweet for what there was. This box served as two purposes. One, it gave me some great 90's cards for that part of my PC. Two, the nostalgia is amazing. Brought me back to when I used to collect with my dad who no longer collects. 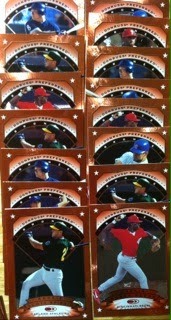 We had some great times opening packs of Donruss trying to see who would pull the big insert first. I think I won most of the time. Just a few more of the Yard Sale posts to go. Stay tuned! FINAL WINNER OF SEPTEMBER CONTEST ANNOUNCED! 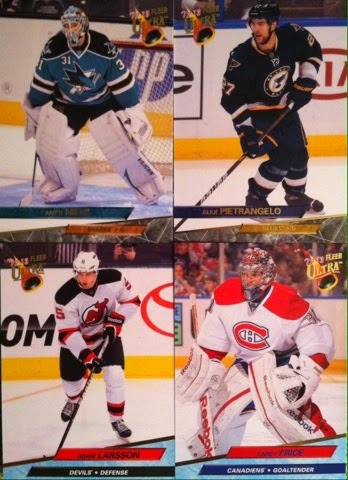 WIN These NHL Cards From The Pack Gambler! September Contest Week 1 Winner!